Afghanistan Taliban says intentional killing of innocent people is "against the basics of Islam". The Afghanistan Taliban on Tuesday condemned their Pakistani counterpart over an attack on a school in Peshawar that killed 141 people. 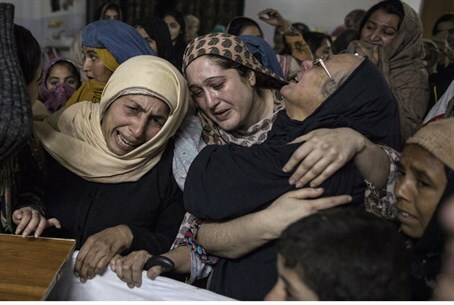 "The intentional killing of innocent people, children and women are against the basics of Islam and this criteria has to be considered by every Islamic party and government," group spokesman Zabihullah Mujahid said in a statement quoted by Reuters. The Pakistani Taliban are separate from but allied to the Afghan Taliban across the border. Both aim to overthrow their own governments and establish an Islamic state instead. 132 children and another nine staff members were killed in Tuesday’s attack, the largest in years in the country. The attack started with a diversion as a car exploded behind the school. After breaking into the school and going room by room gunning down children, the terrorists were finally stopped hours later by Pakistani soldiers who performed a sweep of the buildings, eventually succeeding in eliminating all of them. The attack was also condemned by United Nations (UN) Secretary General Ban Ki-moon, who called it a "blood curdling" attack on "defenseless" children. Ban said the "hearts of the world go out" to the parents and families of those killed in the brazen attack. "No cause can justify such brutality; no grievance can excuse such horror. It is an act of horror and rank cowardice to attack defenseless children while they learn," he said, adding that schools must be safe and secure learning spaces and getting an education is every child's right.